Huddle is an online tool that lets work colleagues share content and describes itself as "the global leader in secure content collaboration". "If somebody is putting themselves out there as a world-class service to look after information for you, it just shouldn't happen," said Prof Alan Woodward, from the University of Surrey. 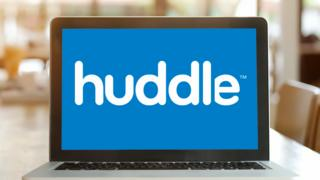 In a statement, Huddle said the bug had affected "six individual user sessions between March and November this year". "With 4.96 million log-ins to Huddle occurring over the same time period, the instances of this bug occurring were extremely rare," it said. As well as a BBC employee being redirected to the KPMG account, Huddle said a third party had accessed one of the BBC's Huddle accounts. KPMG has not yet responded to the BBC's request for comment. The company later disclosed that a third party had accessed the Huddle of BBC Children's programme Hetty Feather, but it said no documents had been opened. During the Huddle sign-in process, the customer's device requests an authorisation code. "We wish to clarify to Huddle users that this bug has been fixed, and that we continue to work to ensure such a scenario is not repeated," the company told the BBC. "We are continuing to work with the owners of the accounts that we believe may have been compromised, and apologise to them unreservedly."